We are finishing the new album from Opal, 17, a project that includes different disciplines such as music, dance and image. All the songs are recorded, we have the photos with the whole image, we have the new website, we even recorded a video clip and we have assembled a multidisciplinary show with all the work ... But we need the money to release it. With a touch of magic and mystery, an exciting journey inward, we believe that 17 is the most mature and with more essence so far, we have put on it much effort and enthusiasm. The disc means, therefore, a clear step forward. I debuted my solitarie career with my first work "*Sueños*" (*Dreams*, 2004) and published my second album "*Pienso distinto*" (*I think differently*, 2009) in the U.S., the two were self-funded. I believe in self-management, because it allows me to continue expressing myself with independence and artistic freedom. I think crowdfunding is a beautiful and useful tool, which allows people to participate actively in the project and enable it to become a reality. Somehow it is also yours. It have been two years of intense search, creation, composition, rehearsals, collaborations, photo shoots, video recording, recording the songs ... And '**17**' has finally taken shape , a conceptual work that draws on different disciplines (music, picture, dance, video) and moves in two directions: towards the future, using new sounds and towards the past, searching through the symphonic rock textures. 17 is magic, dream, love, frustration, hope, illusion, pain ... A place to experience the emotions, where one can ask questions and seek answers, a place to be oneself. Composed of 12 songs, I have the collaboration of different artists like: Vincent Roca (coauthor and artistic producer), Valérie Catalá Pilato, Ramón Jiménez, Quico Tretze, Mònica Samit and Yolanda Benages. Thanks to this cultural and artistic exchange, 17 has been growing and getting rich, finding its own language. 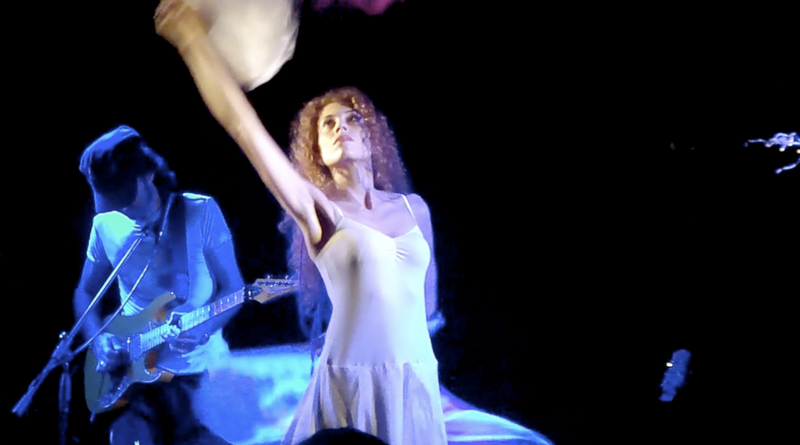 The pre-premiere of the show with new songs was held on June 29, 2012 within the program of the Festival "30Nits" in Sabadell, very well received by the public and critics. I sincerely believe that is the best I've done so far. As many of you know, the cost to record and release an album far exceeds the amount we ask. So far and with much effort, we were able to largely finance it: recording studio, mixing, photo shoots, props, website, video ... which is an extremely high cost. But we no longer can finance the last step, which is the physical CD publishing, the materialization of the work, the step forward. The 2200 euros will go entirely to pay the mastering and CD manufacturing and distribution. We estimate that the disk can be finished at the end of December 2012. A quince días de que finalice el plazo para nuestro proyecto, tenemos toda la esperanza y la ilusión de conseguirlo. Sabemos que la difusión es una parte fundamental para el éxito del proyecto y por eso os pedimos que durante los días que quedan, lo compartáis en vuestras redes sociales, amigos y conocidos. Estamos seguros de que con la ayuda de todos lo conseguiremos! Aprovecho para agradeceros de nuevo vuestra fe en Ópal y vuestra implicación en el proyecto, sin vosotros no sería posible. Muchísimas gracias y hasta pronto! Gracias a todos los que estáis colaborando en este proyecto. A paso lento, pero seguro, entre todos lo haremos posible! DIGITAL PACK: Digital album download. CD PACK (Only Spain): Digital album download + Your name in Opal's website as a patron of the project + Physical CD signed. CONCERT PACK: Two concert tickets to the premiere show of the album EXCLUSIVELY FOR PATRONS (during the month of January in the province of Barcelona) + Digital album download + Your name on Opal's website + Physical CD signed. GIFT PACK: Four concert tickets to the premiere show of the album EXCLUSIVELY FOR PATRONS (during the month of January in the province of Barcelona) + Digital album download + Your name and the name of another person on Opal's website + 2 Physical CDs signed + Digital download of the album "Pienso distinto". REHEARSAL OR TRAINING PACK: ASSISTANCE (2 people) to one REHEARSAL OR one INDIVIDUAL LESSON to choose from: voice, guitar or bellydace (assistance for 2 people in dance) taught by Opal (voice and dance) / V. Roca (guitar) in person if the geographical area allows it or videoconferencing by Skype + EVERYTHING INCLUDED IN THE GIFT PACK. COMPLET PACK: ASSITANCE (2 people) TO ONE REHARSAL + ONE INDIVIDUAL LESSON to choose from: voice, guitar or bellydace (assistance for 2 people in dance) taught by Opal (voice and dance) / V. Roca (guitar) in person if the geographical area allows it or videoconferencing by Skype + Hand-written lyrics of the song of your choice, signed by Opal + Signed photo + EVERYTHING INCLUDED IN THE GIFT PACK with 4 physical CDs and 8 concert tickets. PRIVATE CONCERT: A private unplugged concert where you want to organize a dinner with friends! (+ Traveling expenses) + Signed photo + Hand-writted lyrics of the song of your choice, signed by Opal + EVERYTHING INCLUDED IN THE GIFT PACK CD with 4 physical CDs and 8 concert tickets. CONCERT OPEN TO THE PUBLIC: A concert open to the public at the place you want that complies with the necessary features (+ traveling expenses ) + 2 signed photos + hand-writted lyrics of the song of your choice, signed by Opal + EVERYTHING Included in the pack GIFT CD with 8 physical CDs and 12 concert tickets. EVERYTHING! And .... I INVITE YOU TO DINNER: If you choose this option I invite you and another person to dinner at my house and I cook! And of course, everything else: CONCERT OPEN TO THE PUBLIC PACK with 10 physical CDs and 14 concert tickets + ASSISTANCE TO A REHEARSAL (2 people) + ONE INDIVIDUAL LESSON to choose from: voice, guitar or bellydance (assistance for 2 persons in dance) taught by Opal (voice and dance) / V. Roca (guitar) in person if geography zone permits it or by Skype videoconferencing.